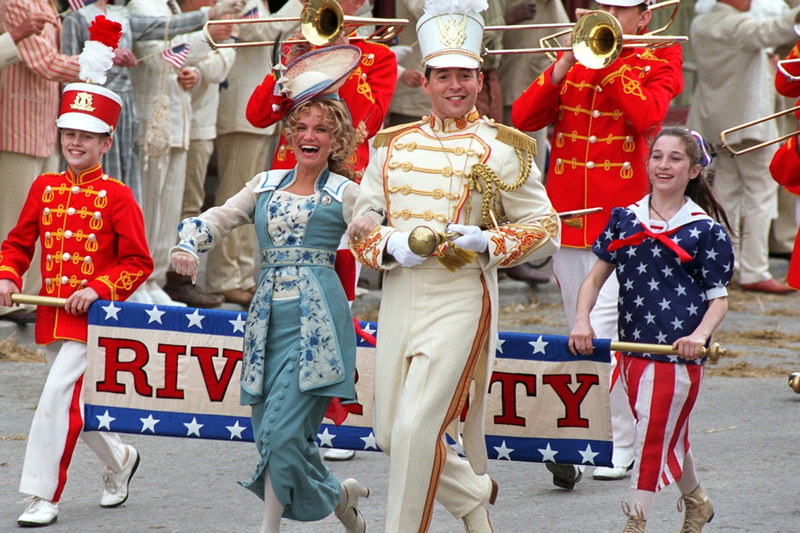 The Music Man has been adapted into two movies: in 1962 and 2003. The Music Man was a huge hit on Broadway, and it became a huge hit in the cinemas as well. There were a few big stars in mind to play the role of Harold Hill, such as Frank Sinatra and Cary Grant. Cary Grant declined the role, claiming that he wouldn't even watch the motion picture unless Robert Preston played the lead male role. Willson and Morton Da Costa, the director of the show, insisted that Preston play the role, as in the Broadway show. Robert Preston is the one and only Harold Hill. Barbara Cook, who played Marian Paroo on Broadway, was disappointed when the role in the picture went to Shirley Jones. Jones was famous for playing lead roles in movie adaptations of Rodgers and Hammerstein musicals Oklahoma! and Carousel. Several other cast members from the Broadway show also joined the cast for the movie: Pert Kelton, who played Mrs. Paroo; the Buffalo Bills, the barbershop quartet who plays the school board members; and Peggy Mondo, who played Ethel Toffelmier. Some other famous actors were cast in the movie version. Buddy Hackett, known for It's a Mad, Mad, Mad, Mad World, was cast as Marcellus Washburn; Hermione Gingold, known for her work on the stage, was cast as Eulalie MacKechnie Shinn, the mayor's wife; and Ronny Howard, who was not famous at the time, but grew up to be a high-profile film director. For more information, check out Turner Classic Movie's (TCM) movie database and the Internet Movie Database. Below is Robert Preston performing Harold Hill's song "Ya Got Trouble," and underneath is the final scene of the movie, a huge band performing "76 Trombones." This film remake is a much different take than the very popular original. Matthew Broderick, known for his role as Ferris Bueller in Ferris Bueller's Day Off, was cast as Harold Hill. Broderick knew that he was no Robert Preston, but he knew he could offer something new to the role. Broadway star Kristin Chenoweth was appropriately cast as Marian Paroo, mainly because of her beautiful, booming voice. The two stars bring a new, fresh take on the roles. Under the picture below is a video clip of the remake - the scene where Harold Hill convinces the entire town of River City that they need a boys' band.